Skinner to Present Mechanical Wonders During Clocks, Watches & Scientific Instruments Auction, April 25 | Skinner Inc.
BOSTON, MA – April 10, 2015 – Skinner, Inc. will host a live auction of Clocks, Watches & Scientific Instruments on April 25th, featuring nearly 300 lots and covering a range of mechanical masterpieces, from fine American and European timekeepers to musical clocks, early navigational instruments, intriguing automata and more. Collectors can also indulge their curiosities during an accompanying online-only auction of Clocks, Instruments & Militaria, running from April 21st to April 27th, spotlighting a large, private collection of World War II objects. Leading a selection of early American timepieces is the Collection of Terry and Karen Brotherton, a Texas couple who spent the last 45 years seeking out rare and high-quality pieces. Over 50 lots, representing the couple’s entire collection, will be on the block. Joseph Ives’ innovative “wagon springs” were among the Brothertons’ favorite collectibles, including such rarities as an 1840s Ives hourglass “wagon spring” clock (Lot 54, estimated between $8,000 and $12,000) and a “Brooklyn” “wagon spring” shelf clock. Additional offerings include a Joseph Nye Dunning wall clock, made in Burlington, VT, c. 1820 (Lot 50, $15,000 to $25,000) and a Forestville Manufacturing Company rosewood veneered acorn clock, hailing from Bristol, CT, c. 1850 (Lot 44, $8,000 to $12,000). 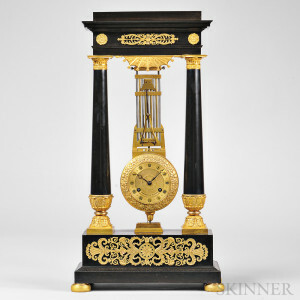 An assortment of magnificent French clocks will be up for auction, with standout examples including an ebonized, two-column inverted swinging clock, c. 1830 (Lot 145, $4,000 to $6,000). An early 1800s Thwaites mahogany table clock, No. 3005, leads a selection of desirable English timepieces (Lot 116, $6,000 to $8,000). A selection of late 19th and early 20th century automata will also be available, including two high-quality, life-like pieces crafted by the French maker Gustav Vichy. One depicts Pierrot serenading the moon (Lot 263, $40,000 to $60,000), while the other represents a black magician holding a tray of fruit (Lot 264, $25,000 to $45,000); both as animated in their movements as when they were first created. Skinner is pleased to offer a collection of more than a dozen globes and celestial instruments belonging to pioneering American astronomer Vera Rubin. 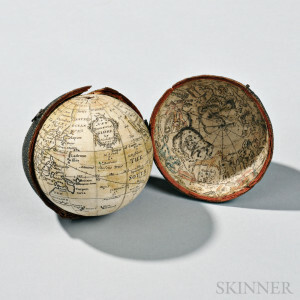 Highlights include a Nathaniel Hill 2 1/2-inch Pocket Globe, c. 1754, illustrating the Northwest portion of America as “Unknown Parts,” and featuring a fish-skin-covered wood case lined with twelve hand-colored printed gores of the celestial maps (Lot 223, $5,000 to $7,000). Another intruging item in the collection is an elaborate Ernst Schotte & Co. Orrery, crafted in Germany, c. 1870 (Lot 226, $15,000 to $25,000). Additional highlights include a robust array of 18th and 19th century navigational instruments, such as a rare mahogany octant reportedly hailing from Barnstable, MA, arriving with a handwritten note indicating that it was registered at the New Bedford Customs House (Lot 241, $1,500 to $2,500). An exemplary combination of science and clock making, a William Hardy spring pallet observatory regulator, c. 1825, is also sure to excite collectors (Lot 104, $70,000 to $90,000). Skinner is pleased to present a curated selection of clocks, scientific instruments and militaria at a range of affordable price points during an online-only sale taking place April 21st through 27th. Standout offerings include a large World War II collection, encompassing personal items, uniforms, equipment and more, owned by the late Jay Gaynor, Director of Historic Trades at the Colonial Williamsburg Foundation. Clock and watch making tools are well represented, as well as a variety of pocket watches and fine clocks. Bidders can participate at any time during the eight-day auction from the comfort and convenience of home, and have the added value of previewing the online-only lots in person during the regular Marlborough preview hours. Previews for the auction will be held at Skinner’s Boston gallery on Wednesday, April 22nd, from noon to 5 P.M., Thursday, April 23rd, from noon to 7 P.M., and Friday, April 24th from noon to 7 P.M. The illustrated Catalog for sale #2804M is available from the Subscription Department, at 508-970-3240, or from the Gallery. Prices realized will be available online, at www.skinnerinc.com, both during and after the sale. The Skinner website enables users to view every lot in the auctions, leave bids, order catalogs and bid live, in real-time, through SkinnerLive! and Bidsquare. Skinner auctions draw international interest from buyers and consignors alike, with material regularly achieving record prices. The company’s auction and appraisal services focus on fine art, jewelry, furniture, and decorative arts from around the globe, as well as wine, fine musical instruments, rare books, Asian art, clocks, Judaica, and more. Monthly Skinner Discovery auctions feature a breadth of estate material. Widely regarded as one of the most trusted names in the business, Skinner appraisers have appeared on the PBS-TV series, Antiques Roadshow, since the show’s inception. 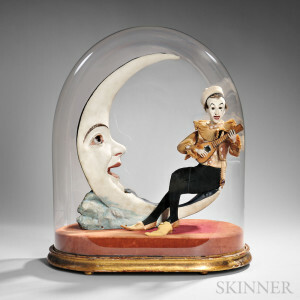 Skinner has galleries in Boston and Marlborough, Massachusetts, as well as in New York City and Coral Gables, Florida, with bidders participating in person, by phone, and online. Join auctions live with SkinnerLive! and Bidsquare. For more information and to read our blog, visit the website at www.skinnerinc.com, find us on Facebook, or follow us on Twitter. This entry was posted in News and tagged age of exploration, american clocks, antique clocks, auction, automata, Bernhard, cast iron banks, european clocks, french clocks, globes, horological, Howard, mechanical banks, Militaria, Mulliken, Munroe, musical box, navigation, pocket watch, repeating circle, Robert Cheney, scientific instruments, timepieces, Willard by Skinner. Bookmark the permalink.